ePub file 5.7 MB Best for mobile devices. mobi file 9 MB Best for Kindle 1-3. Do employee- based, receipts-based, or some other criteria better define a small business in each industry? How can small businesses be defined in such a way as to both boost those businesses and help DoD be more efficient and effective? How can DoD use strategic sourcing to reduce its total costs? How can DoD meet its small business goals? The Department of Defense (DoD) may face challenges as it attempts to maintain its goal of spending about 23 percent of its prime-contract dollars for goods and services with small businesses and at the same time apply strategic-sourcing practices to reduce total costs and improve performance in ways that will not conflict with small-business goals while making DoD purchasing more effective and efficient. Strategic sourcing practices, for example, recommend consolidation of the supply base to reduce total costs, which can lead to fewer, larger, longer-term contracts with fewer and, often, larger suppliers. Classifications should consider whether the industry in question is homogeneous in firm size and spending among its subindustries. For several industries, regulators may wish to reconsider whether an employee-based, receipt-based, or some other measure is most appropriate for size classification. When considering measures to classify firms as "small," policymakers should consider the minimum size firms need to be to remain competitive. They should also take into account the size needed to attract credit. Consideration should also be given to the minimum size needed to administer a federal contract. The competitiveness of the industry should also be factored into discussions about firm size. The research described in this report was conducted within the Acquisition and Technology Policy Center of the RAND National Defense Research Institute, a federally funded research and development center sponsored by the Office of the Secretary of Defense, the Joint Staff, the Unified Combatant Commands, the Navy, the Marine Corps, the defense agencies, and the defense Intelligence Community. 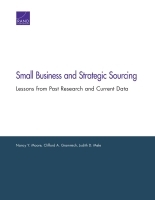 Moore, Nancy Young, Clifford A. Grammich, and Judith D. Mele, Small Business and Strategic Sourcing: Lessons from Past Research and Current Data. Santa Monica, CA: RAND Corporation, 2014. https://www.rand.org/pubs/research_reports/RR410.html. Also available in print form.